It was an honour to MC the Safe Steps family Violence response centre’s Safetea at Melbourne’s RACV club. Women and children in Victoria have been supported by the good people at Safe Steps for decades. In the lead up to this event I discovered some women are still in the dark about the good work they do so here’s a quick rundown. SafeSteps is Victoria’s 24/7 family violence response service. It is on the frontline and works towards a community free from family violence through education and social change initiatives. Trained professionals help families recover from trauma. women and children provided with safe emergency accommodation. worth of material aid to women and children. If you cannot safely call the 24/7 phone line, please email safesteps@safesteps.org.au and a support worker will reply to you ASAP. Engaging Women is honoured to be able to share Safe Steps good work with our wonderful community. 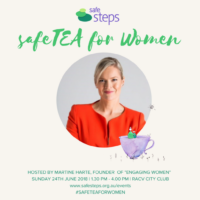 Founder Martine Harte is looking forward to hosting the 2018 ‘safeTea’ for Women at the RACV Club on Sunday 24th June, 2018. Book here. 110 tickets have sold and they have just 10 left! If you cannot attend please consider donating to Safe Steps so they can continue their vital work for women and children. Donate by zipping over to their website here. When was the last time you and your friends saved a life together? Come along to the safe steps Family Violence Response Centre ‘safeTEA for women’ and you’ll be helping raise vital funds to provide emergency accommodation and support for women and children escaping family violence. Entertainment is by The Voice’s Kelsie Rimmer. This high tea with a purpose will include delicious pastries, sweets and bubbles. There will also be prize packed silent auction and raffle! All proceeds will help women and children escaping family violence. So go on, gather your friends for a great afternoon supporting a good cause! Posted in Ambassador for Good, General.